Thus spoke the late Father Gerard Jean-Juste, Haitian activist and the former pastor of Sainte Claire’s Parish of Ti Plas Kazo, a few weeks before his death. He was a champion of democracy and human rights in his country and amongst the Haitian Diaspora. Father Jean-Juste was twice arrested by the de facto regime of Gerard Latortue (2004-2006). The regime was backed by the International Community [especially United States, France and Canada who led the 2004 coup d’état along with the Haitian elite]. The 2004 coup that ousted democratically elected President Aristide forced him to live in exile in South Africa for seven years. If Father Jean-Juste was alive he would amongst the signatories of a recent letter signed by intellectuals and activists around the world calling for the return of Aristide to Haiti and for the annulment of the sham presidential election that is about to proceed to a second round. Father Jean-Juste might have said, “In the name of brothers and sisters in Haiti, those in the eleventh department and those who cannot write and sign this letter, but are always in the street demonstrating and constantly praying for your return, I join my voice with them to wish you and your family a good and safe return home. May your return serve as salt and light for Haiti and your Haitian compatriots.” Haiti needs all of its children, and this is a time for Haiti’s children to say what they can do for Haiti, but not what Haiti can do for them. Western corporate media, including local elite-run media, continue with their biased reports regarding the Aristide government. They fail to understand what the majority of Haitian people want and ask for. 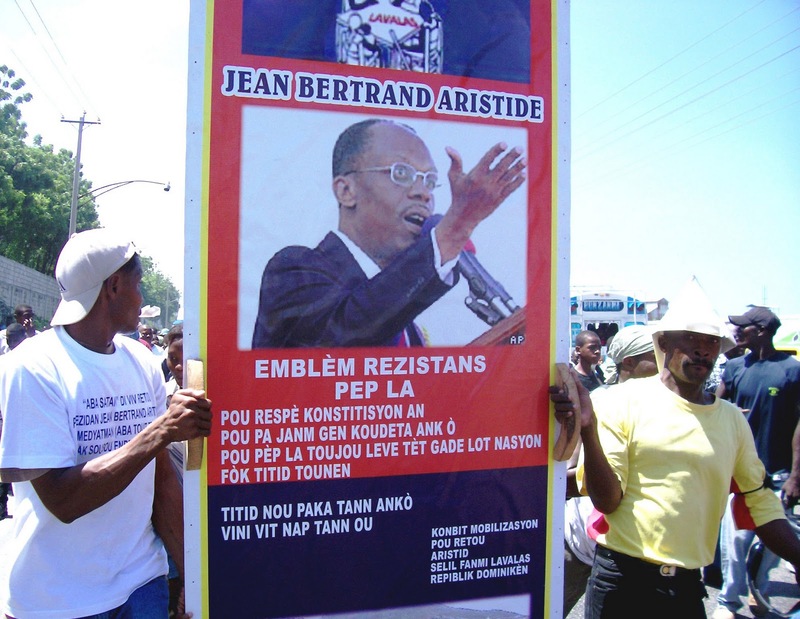 Seven years after he was forced to leave his office, President Aristide still has the support of the majority in Haiti. That is why the vast majority of eligible voters did not participate in the sham presidential election of November 28. Aristide's party (Fanmi Lavalas) and numerous others were banned from participating by the provisional electoral council (CEP). The CEP remains in tact despite its flagrantly anti democratic rulings. There is no reason to doubt that the massive boycott of the first round will be followed by another, at least as massive, in the second round. While Presidential candidate Mirland Manigat said that she would prefer that President Aristide stay in exile until the runoff presidential of March 20, people around the world as well as in Haiti continue to extend their full support to President Aristide. Aristide’s return remains important at a time when Haiti is suffering because of lack of leadership and the exclusion of the poor in the decision-making for their country. While religious leaders in Haiti, [especially those from the Catholic Church who play an important role in Haiti’s politics] continue to support the 2004 coup d’état, religious leaders in other parts of the world stand for democracy in Haiti – and President Aristide is the symbol of this democracy as its first freely elected president. Under Aristide, Haiti also witnessed its first democratic transition of power in 1996 when Aristide passed the nation’s leadership to his former Prime Minister Rene Garcia Preval. Haitian presidents are constitutionally barred from serving consecutive terms. Aristide was elected to a second term in 2000. Aristide's return home is now imminent as well as long overdue.